Icy roads in the morning and even the first signs of snow at football training. Make no mistake, winter is upon us and you need to be prepared if you don’t want your training sessions to feel worse than a Roberto Carlos free kick to the face. Find out how to pack your bag for the winter weather here. 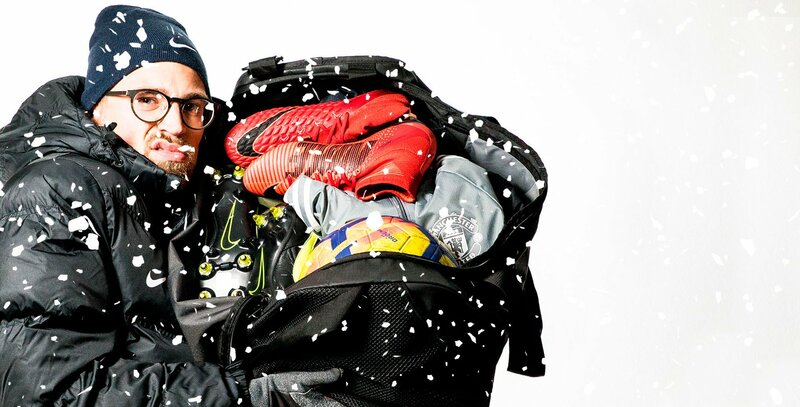 If you want the ultimate football packing list, so you know you're not missing anything that would make your training session better, then read along or watch the video below here to get the full overview of all the gear we recommend using during winter. Wearing the right gear is incredibly important if you want to get the most out of your work, because if you’re cold and don’t feel good on the pitch, then you can’t hope to perform your best physically. In the video above you will see JayMike picking out his winter essentials, which include clothes and gear that will keep you warm, but not weigh you down. Among them you will find Under Armour Baselayer, long sleeve tops that are designed to transport sweat, but still keep you warm, player gloves and the absolutely essential neckwarmer. There are also lots of other professional tips in the video of gear you might not have thought about, but will all help you play better this winter. Remember, winning in spring starts with training in winter. You can find our selection of winter football gear here and upgrade your game for the new season. All in kids sizes too.